The Liberal Radicalism funding model is a (possibly ideally) efficient way of allocating goods, but is built on a number assumptions that deserve tight consideration, and I will present a simple way to compose a more liquid implementation that allows an open ecosystem to build on the mechanism without over-committing to any particular core assumption. Individuals casting votes / donations. An identity strategy recognizing those individuals. The amount received by the project is (proportional to) the square of the sum of the square roots of contributions received. Most of the LR implementations that I’ve seen in production today are building their own identity registry, their own funding application registry, and are funding their own project. It makes a lot of sense to do your own identity verification if it’s your own money at stake, but there should be a better way. Imagine for a moment that each of the inputs for LR were its own open system. Anyone would be free to start an identity registry. Anyone could become a patron and match the votes of the identity registries they subscribed to. And lastly, the one component that I will argue should maybe be unified into a single component: The funding applications and individuals submitting donations could be done through a single sub-system. If this is looking a bit like a neural network, that’s probably because the principle is very similar: The donation matchers want to know where to put their money, and they’re allocating it according to a distribution dictated by one or more identity registries, which dictate that allocation power to some number of individual accounts, which allocate that power to some number of funding projects. You can make this a little simpler / more recursive by combining the donation matchers and individual donors into a single layer, wherein an individual decides by what identity scheme they’d like their donation to be divided/matched. You might notice donation matcher C is subscribing to two identity registries (B and C), and this opens them up to double-backing a voter, if both of those registries identified the same person. I would argue that as a composition tool, and there are many reasons a backer might do this: These registries might represent geographically disparate groups, or the backer might just be “hedging” between a couple identity registries. In particular I’d like to highlight that by having a single registry for funding applications, funders can experiment with any combination of allocation strategies they like, without being locked into one, so if one is found being corrupt, the funder/voter could easily adjust their allocation strategy accordingly. Obviously the registries can (and will) be a distributed layer as well, but since Liberal Radicalism requires allocating according to discrete projects by discrete voters, having them enumerated a single time would allow voter/donors’ contributions to potentially be backed many times over, by many different funds, proportional to how strong they are able to establish their identity among those funders’ networks. 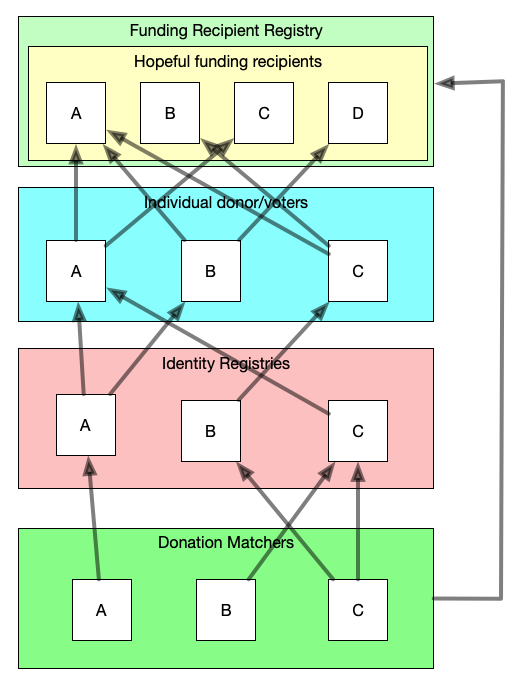 Since I’m suggesting backers might want to hedge between identity registries, since each one is a potentially centralized power center, perhaps a donation matcher would also like to hedge between this entire scheme and other donation schemes. I would argue that isn’t even a proposal, it’s a description of reality. By not donating all of their funds, donors are constantly “hedging” their donations between external groups and their own immediate capacities. The question is not whether or not it is ideal to hedge between multiple strategies for accomplishing our collective goals, the question is whether we will build our fundraising tools to gracefully compose these many strategies. For Liberal Radicalism, I think that grouping the funding recipients in a single modular registry could be a useful tool for more gracefully embracing the dynamic nature of cautiously and intelligently trying out such experimental funding models. Decentralized web developer at ConsenSys working on MetaMask, with a background in comedy, writing, and teaching. Exploring the frontier of human collective empowerment via technology.